The Out on a Limb Standing Zombie is not standing out on a limb, but rather looks like it is now missing a limb. Luckily, missing does not mean lost, because this zombie seems to have its missing limb safely in its hand. How, exactly, this poor zombie managed to lose its limb, though, is anyones guess. This impressive decoration depicts a full-sized zombie as it stands seemingly wracked in pain, or at least as close to pain as a zombie is capable of feeling. This zombie has greenish brown hued skin, giving it a decrepit and decaying look. It also features a number of cuts, scrapes, and tears along its face and neck that further enhance the look of decay and damage that most zombies typically feature. Strands of scraggly white hair hang limply from the side of the zombies head. In one hand, the zombie seemingly holds its other hand, which has been severed from its opposite side. It wears a white shirt that has been stained with quite a bit of blood, as well as soiled and dirty brown trousers. 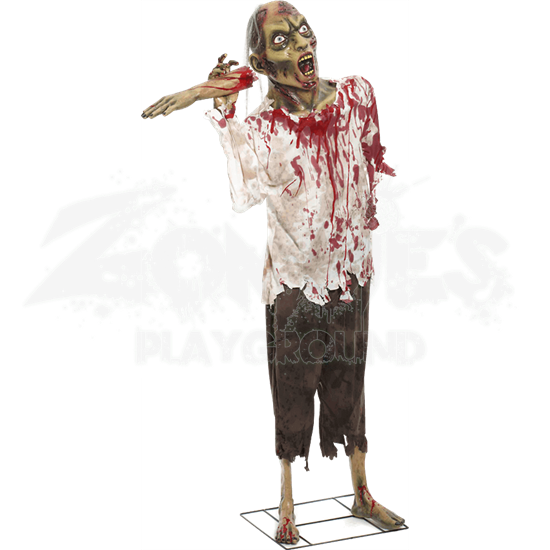 This prop stands approximately 72 inches (6 feet) tall, making it a real life-sized zombie, and it is made from plastic, latex, and polyester. A metal stand is included to keep this zombie on its feet. 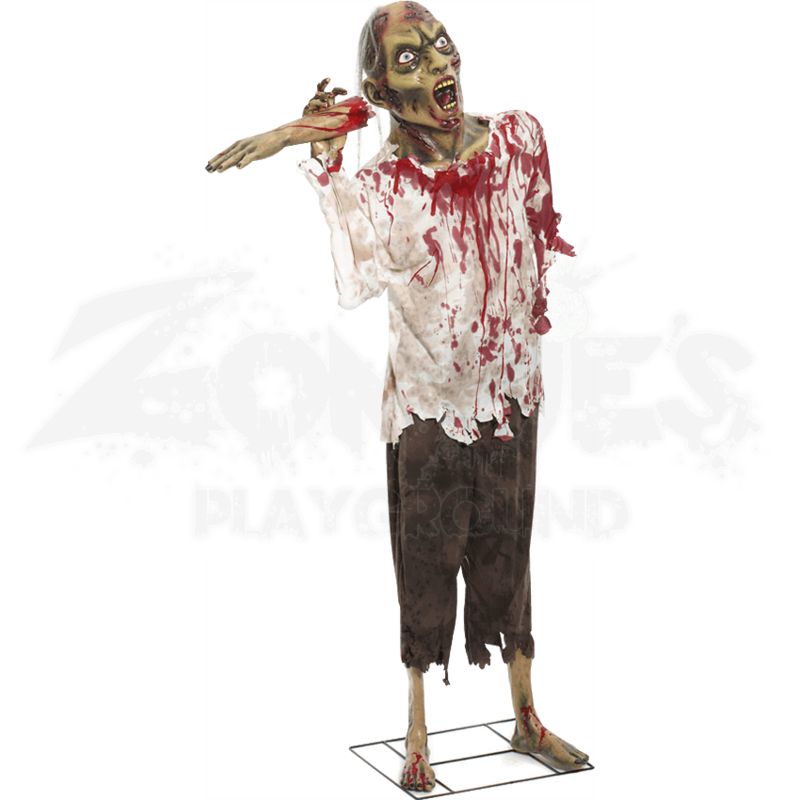 The Out on a Limb Standing Zombie is the perfect prop to decorate with, whether you are just decorating your house or putting together a Halloween party. If nothing else, it is definitely an amusing and startling item that is sure to scare more than its fair share of passersby on whenever night falls.